Sovereign Pest Control offers a “Service When You Need It” program that ensures you will be treated and retreated as you need it, as needed. 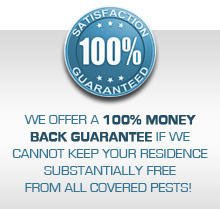 We are confident that this is the best value in residential pest control services. 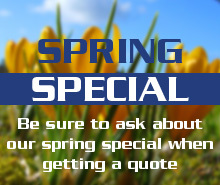 With such pride in our product; we offer a 100% money back guarantee. Pest Control Services Includes: Assessment of infestation, providing of appropriate applications for covered pests as determined, annual inspection and preventative service. Platinum Pest Control Service Plan clients receive all the benefits of the Pest Control Service Plan plus the advantage of free termite inspections and discounts on all Specialty Services, including Termite Treatments, if an active infestation is discovered. Includes: Assessment of infestation and application of combination of fire ant service with a flea treatment. Additional applications to the yard and residence available. Includes: Fire ant service with annual inspection and granular application to yard. Additional applications to the yard and residence if a fire ant infestation occurs. Service Options: Call the professionals at Sovereign Pest Control to eliminate the fleas and ticks from your yard and home with our effective and proven methods. Sovereign Pest Control Services for your yard and home are effective and proven methods. Including: flea & tick, mosquitoes, yard service, fire ant service, pet lovers’ service, outdoor party service, stink bug-box elder bugs, bee nest removal, fly prevention, pantry pests, entry point elimination and cicada killers.